Wonderful, rare Bobble Head, we have just one left. The company that made these went out of business. We want him to find a ghoul home. 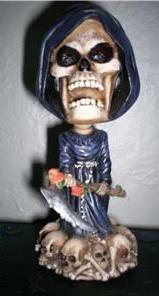 Reaper will bob his head to the beat of your heart, well not quite, but he's ready to bop. These are brand new and in original box. Extremely rare now, a true collectible item.